Kids like leftovers, too! And they like dishes that allow them to browse around and select what they want. 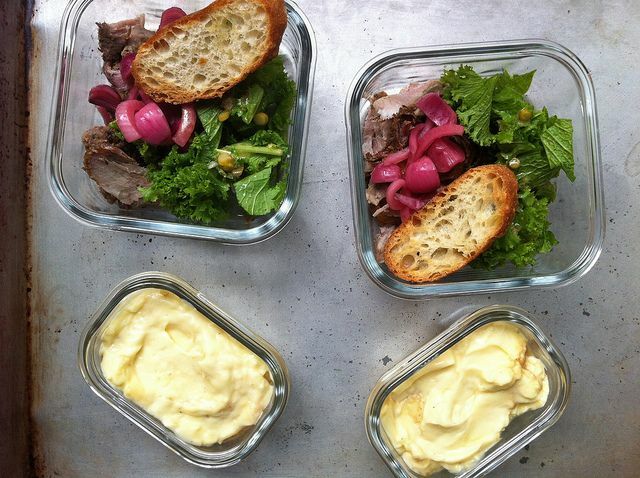 We had a dinner party, so I sent our kids to school with Luciana's Porchetta, pickled onions, garlic-rubbed crostini, and baby mustard greens (from the CSA I just joined) dressed with leftover vinaigrette. For dessert: Crème brûlée! But I just called it pudding. Love seeing these lunches. I also love the ceramic and glass containers. Do they come with tight fitting lids? Could you tell us where to source containers like these? Would like to find some reusable non-plastic containers for lunches. Thanks! And happy eating. I'll bet all the kids in the class want to swap lunches with Walker and Addie. My oh my, what lucky kids.